Keda Publications What is Stareway To Spelling? Who is Stride Ahead Designed For? How is Stride Ahead Delivered? What is Stareway To Spelling? A manual designed to ensure that any student can read and spell the 300 most used words in the English language quickly, confidently and accurately. Are you aware, for example, that there are 300 words in English that are used more than any of the other thousands of words found in the language? And are you also aware that these 300 words alone form 72% of the all the words that an average English speaker uses when speaking English every day? From those two facts alone you can appreciate that being able to correctly identify read, write and pronounce these 300 key words is essential for every English speaker, native or non-native. The problem many a child and adult face is that although they may be fluent English speakers, the writing and spelling of English is very challenging. That is because the spelling and pronunciation of English is very complex. There are only 26 letters in the English alphabet, but there are 44 different sounds the alphabet can produce. These 44 different sounds, have 176 different ways they are commonly spelt. In total, there are an astonishing 1,120 different letter combinations for spelling these sounds. If you compare English to Italian, Italian only has 25 different sounds with only 33 ways to spell those sounds. This makes it far easier for weak readers or dyslexic Italian speakers to learn to read the language. As you can see by the numbers, with so many different sounds, letter combinations and pronunciation, for weak readers or dyslexic English speakers there any many more pitfalls. Good spellers generally have one thing in common: they have good image recall. This means their connections between sight and sound are well developed. They quickly, intuitively, know how to link the sight of a word (written text) to the sound of the word. When good spellers write a word they can visualize the shape and relative position of the letters clearly. They almost intuitively know how to correctly pronounce and spell a word that may confuse and confound ‘weak’ spellers. If good spellers are unsure of the spelling of a particular word, they may well write out various versions to see which looks right. By contrast, weak readers and dyslexics have poor image recall. As a result, they are unable to quickly and intuitively link the sight and sound of a word as efficiently as good spellers. This is where Stareway To Spelling can help students struggling with their spelling, or with their ability to link the sight of a word to its sound. Stareway To Spelling ensures a student can remember and recall at will all of the 300 most used words in English. Furthermore, there is a huge boost in their own self-esteem. They are now competent and confident spellers of the English language. Whereas before they had no rules, no structure, no reference on how to begin to decode and apply the bewildering range of different spelling and pronunciation the English language contains. How is Stareway To Spelling Taught? AFTER COMPLETING STAREWAY TO SPELLING STUDENTS WILL BE ABLE TO READ AND SPELL THE 300 MOST USED WORDS. 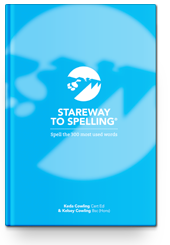 Enjoy this video of Keda’s son and co-author of Stareway To Spelling, Kelsey Cowling, explaining What is Stareway To Spelling? Join Keda Publications EXCLUSIVE VIP Club!